Fall Registrations begin in May. Spring Registrations begin in November. 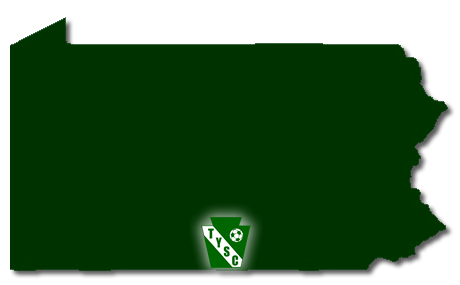 The Tuscarora Youth Soccer Club (TYSC) is a competitive travel soccer club serving locations in and around the Tuscarora School District,Franklin County, PA and the Tuscarora Mountain including, but not limited to, Mercersburg, Greencastle, Chambersburg, Waynesboro, Fort Loudon, Saint Thomas, and McConnellsburg. At TYSC, we promote participation in the game of soccer while teaching the principles of soccer excellence, sportsmanship, athletic skills, team spirit, character and social interaction. The ideals of enjoyment, fair play, safety, integrity and honesty will be emphasized and will be an integral part of soccer play organized by TYSC and by members participating on TYSC teams. We provide age and ability appropriate competition as well as soccer educational opportunities to enable every member of TYSC to achieve their personal goals in their selected recreation. The first Revolution 3v3 was first held in May of 2012. The goal behind the tournament was to allow players from our area to have fun and compete without the heavy entry fees and cost of transportation. With the help from many gracious volunteers, the tournament was a hit with local clubs. In 2013, the tournament added what is known as 'Keeper Wars.' Keeper Wars, though popular with spectators, was removed the following year for lack of registrants. After 4 very exciting years, the Revolution 3v3 concluded for the final time. We hope that in the future, a few enthusiastic volunteers will be able to bring this event back to life! What is Juggling a soccer ball? Very simply, Juggling is using all soccer-legal parts of the body to keep the ball from reaching the ground. Why do we encourage our players to juggle? They don't juggle in the game, so why are they juggling at practice? John Moores University in Liverpool, England set out to discover if juggling a ball with your feet only will have any effect on the ability to juggle with your knees or the ability to control a ball in a game-like situation. The study (to which more information can be found at http://www.footballtricks.com/ViewContent.aspx?nID=319) found that "In 4 weeks with only 10 minutes juggling per day an 8.4% improvement in their stronger foot and 6.8% in their weaker foot was shown in the ability to control a ball propelled at the players. This suggests that the skills learnt in ball juggling can be transferred to ball control in a game situation." It is true that our players will likely never directly juggle in their weekend matches, but the benefits of teaching balance, first touch, focus, aerial control, and commitment, are all very valuable to our sport. In order to promote juggling in our club, TYSC offers juggling tags to our players. Juggling tags are hard plastic tags that the player can attach to their soccer bag and keep track of their progress. 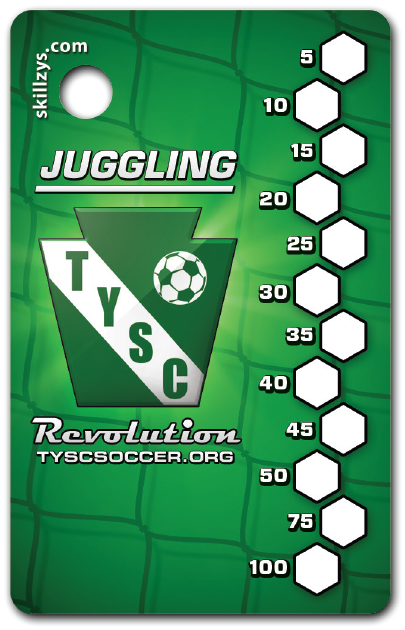 All players at TYSC who reach the first benchmark of 5 juggles is eligible to receive a juggling tag. Just ask your coach! When/How long is the soccer season? Fall (Travel) - The Fall season begins practicing mid-August with games beginning typically over the first week in September. Conclusion of the season is typically the first weekend in November. Sign ups and evaluations for this season are held in May. High school teams do not play travel for TYSC in the Fall as they are playing for their High School teams. Fall (FTTB) - Our local recreation program begins practicing in late-August with games typically beginning in Early September. The season consists of 7 games and we do not play over Columbus Day Weekend. Spring (Travel) - The Spring season begins practicing mid-March (weather permitting) with games beginning in early April. Conclusion of the season is typically the first weekend in June. Sign ups for this season are held in November. 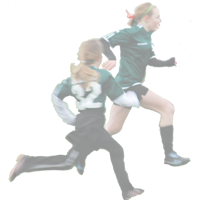 Spring (FTTB) - Our local recreation program begins practicing in late-March (weather permitting) with games beginning in early April. The season consists of 7 games and we do not player over Easter or Memorial Day Weekend. What is the time commitment for practices? Little Kickers/Little Revs Local First to the Ball Program - Teams under 9 should practice no more than 1 hour. Little Kickers teams practice once per week while Little Revs teams practice twice per week. Travel - Because we are a competitive club, practice time is extremely important. For the most part, teams practice twice per week for about 90 minutes each session. TYSC has a local recreation program for players as young as 4 years old. We tell parents that they know when their child is ready to participate independantly in an activity for an hour. After the child reaches 8 and they still have an interest in the game, they are able to move up to our competitive travel teams until they are 18! My child is on a U12 team and just had their 12th Birthday. Do they need to change teams to a U13 team? A soccer year runs from Fall of one year, to Spring of the next year. The soccer U-Age of your child is calculated by subtracting your child's birth year from the Spring Season Year. This means that for the Fall 2017/Spring 2018 season a Child born in 2006 would be a U12 player (2018-2006 = 12) throughout the Fall and Spring seasons. The easiest way to remember this is that you'll be U12 for an entire school year. Are there any geographical boundaries which limit participation? No. TYSC does not have any geographical boundaries. Children may participate on a team, regardless of address, provided that they are able to live up to the commitments and expectations of the team they are on. Players living in other states or under PA West territory will just require additional paperwork to participate on our travel teams. 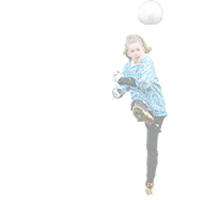 Players are responsible for their own soccer ball (Size 3 for U8, Size 4 for U12, and Size 5 otherwise,) water bottle, cleats (specifically soccer cleats, not football,) and shin-guards for practice. They'll also be required to purchase black shorts and black socks for games. I'm ready to play! Where do I sign up? TYSC holds registration twice a year, for both Fall and Spring seasons. 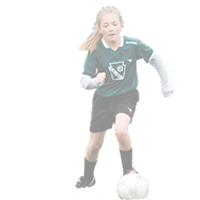 FTTB (Under 9) is an online registration typically spanning May-July for Fall registrations and November-January for Spring Registrations. Travel Fall Registrations are held over a single day evaluation in May and Spring registrations run online from November-December. Links with information regarding specific dates and other information can be found on our home page. 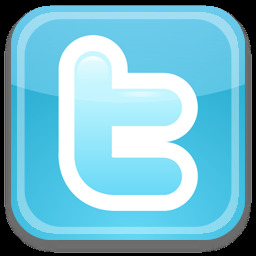 We also encourage parents to follow us on Facebook for the latest updates. How can I purchase TYSC Spiritwear? TYSC Spiritwear is offered every season to active players. Fall seasons typically see apparel with the TYSC Logo and Breast Cancer Awareness items while Spring designs tend to be unique to that season. How can I sign up to volunteer for TYSC? There are never enough volunteers at TYSC. We are always looking for help coaching, assistant coaching, field and equipment maintenance, setting up flags on game day, painting lines... the list is endless. Contact Randy Jarrett to find out how you can help. Do you perform background checks on your coaches? Practice Cancellations - For FTTB practice cancellations are handled by TYSC. For Travel, Specific field closures will be communicated to coaches and broadcast via our alert system. Otherwise, individual travel coaches determine if weather conditions are not appropriate for practice and should contact you via the TYSC Alert system. Game Cancellations - For our FTTB games, practice cancellation policies apply. Both coaches should communicate the cancellation and arrange a reschedule. If a travel coach has not been notified by a club officer or opponent 3 hours before kickoff (6am for a 9am game) about a cancellation, all parties should report to the game field. Within 3 hours of game time, only the referee can cancel a game for unplayable field conditions and that will be done on the field. Lightning Policy - Observed lighting or thunder heard will suspend play immediately, all participants, coaches, match officials, and fans shall seek shelter for a period of no less than 30 minutes. Additional strikes will reset the clock to 30 minutes until the threat has past. Use of good judgment, common sense, and precaution will only result in safety for all involved. Referees should feel, using their best judgement that if the potential threat is present, they have the authority to suspend the match.